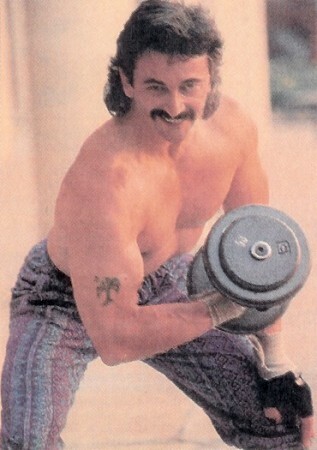 TREE ON A LIMB: Tattooed branches bulge with the biceps of country's Aaron Tippin, a lifter for seven years. He's been lifting for seven years. Body Data: Height: 5 feet 9. Was 142 pounds, now weighs 170. "I think I can carry a little more. Would be real pleased if I can reach 185." Regimen: Low reps, heavy weights. Day 1: legs. Day 2: chest. Day 3: back and shoulders. Day 4: triceps. Day 5: biceps. Why Bodybuild: "I wanted to come to Nashville and at least look decent," and "to live past 30." (He's 33.). Favorite body part: "I get the greatest amount of growth in my arms." Most Difficult Part: "I've always had little pencil legs, and I can't stand them. I beat them to death." Benefit: "I feel so good in the achievement I've made. It's made me realize I can do more in life than I think I can. I take a lot of pride in the fact I have the endurance and stamina to change my body."